We Filipinos love long holidays. After all, Christmas celebrations here in the Philippines start when the last syllable of the month changes to “ber”. Where I now live in Aklan, the local “Akeanons” have added their own contribution to this tradition. Who doesn’t love extended days – even months – of infectious music, lively street dancing, bazaars that promise trinkets and treasures, spontaneous reunions and worry-free drinking? Extravagant Santo Niño festivals to honour the Infant Jesus are common all over the Philippines in January but growing up in Caloocan city (one of the 16 cities that make up the greater metropolitan region of Manila), I didn’t witness such grandeur. 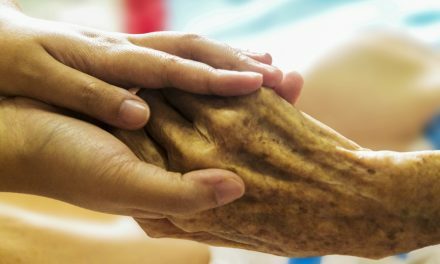 Our fiestas usually involved some food and games with prizes donated by generous neighbours. 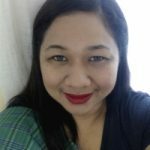 When my family and I moved to Aklan in 2006 and I witnessed the Ati-Atihan Festival for the first time, my understanding of the word “fiesta” changed dramatically. Ati-Atihan is a week-long event. There are concerts, photo contests, programs, and even invited celebrities for evening performances. 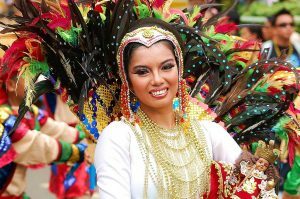 In the streets of Kalibo, Aklan’s capital, marching bands fill the air drumbeats, yells and laughter and the greatest crowds are drawn during the parade of the tribes when people from different places in Aklan dress up like Ati’s (Aklan natives) and perform tribal dances. The highlight of the festival for me, however, is the Giant Parade. 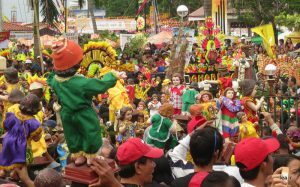 Aklan has seventeen municipalities and each municipality has an entry at the Giant Parade. I come from Tangalan and our entry was a giant fish – symbolic of fishing as one of Tangalan’s main sources of employment. I marvel at how people come together and help build these intricately designed giants – truly a labour of love. Reading about Ati-Atihan, I learned that it is a commemoration of how the Malays who were escaping tyranny reached the safety of the territories of the Aetas. They offered elaborate jewellery for the wife of the dark-skinned leader, they traded with each other, and celebrated the beginning of a friendship. 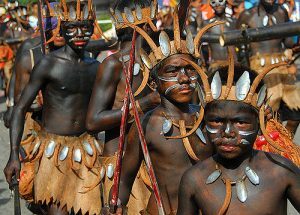 During the festivities, the Malays put soot on their skin so they would look like the Aetas and participated in the latters’ tribal dances. That was the first ever Ati-Atihan festival. Later on, Santo Niño became a major part of the fiesta. The tribe dances while carrying their Santo Niño to show reverence and gratitude. It is for all the blessings that God has given us and for keeping us safe for the whole year. It is always a wonder to witness history and faith embrace each other in a colourful, lively display of faith, culture, talent and love. Viva! I am a high school English teacher, supreme student government adviser, school paper adviser and freelance writer. 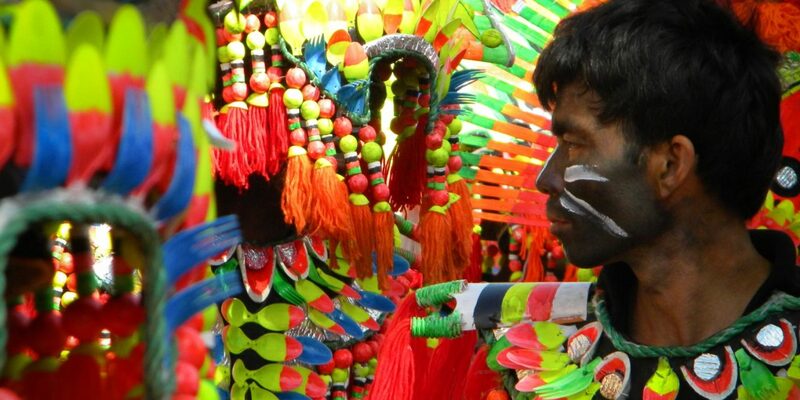 Ati-Atihan is celebrated every third week of January. The highlights of the celebration are the Sinaot sa Calle (Street Dancing) of the Department of Education, the Giant Parade/Contest, Tribal, Modern, and Individual Ati-Atihan Contest, The Feast Day Mass, Religious Procession, Photo Contest, Food Festival, bazaars, Trade Fair, endless street party and endless snake dancing. The province of Aklan is located in the Western Visayas region in the northwest corner of Panay Island. The capital, Kalibo, has an international airport that is serviced by connecting flights out of Manila, Cebu, Kuala Lumpur, Singapore and Guangzhou.